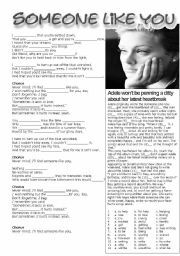 A listening exercise for intermediate adult students based on the on the song Someone Like You by Adele plus an exercise on a text about why she wrote the song retrieved from www.heatworld.com. Students have to listen to the song and fill in the blanks. I used the application at http://www.xara.com/us/3d-heading-maker/ to make the heading. 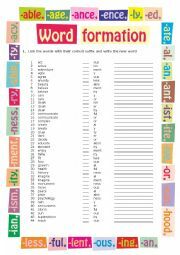 A word formation exercise for intermediate/ advanced students to practice adding suffixes to verbs to complete sentences related to the subject of education. Key is included. A brain teaser for pre intermediate students(A2) to revise general vocabulary. It has been based on the first units of Activate A2. Students have to mark the odd word out. Key included. 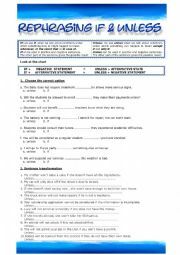 A brief explanation of the meanings of unless and if plus two exercises for intermediate students. Students have to 1- choose the correct connector to complete sentences and then 2- rephrase sentences using unless. 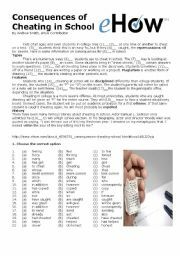 A multiple choice cloze exercise for pre intermediate students based on a text at http://festivals.iloveindia.com/friendship-day/types-of-friends/index.html Students have to do a multiple choice cloze. Key is included. Another word formation exercise for intermediate (B1) students to practice adding suffixes to words. Key included. 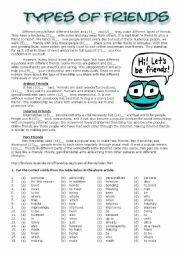 Three exercises for elementary students based on the character of Wall-E. Students 1- have to complete the blanks in a text using the words given, 2- mark True or False and 3- match the words related to Wall-E�s possessions to their pictures. A word formation exercise for intermediate students to practice affixes to complete sentences related to the subject of sport. 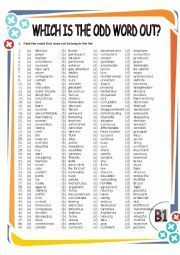 The choice of words has been based on the units of Activate B1. An editable activity in Powerpoint format for pre intermediate/intermediate students. Students have to form a word that fits using negative prefixes in adjectives and fill in the blanks. A Powerpoint game based on the one presented by nurayeyigun (which amazed me!!) 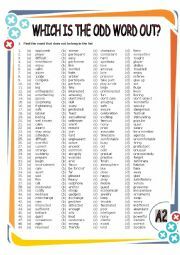 to practice the different words and expressions that use �make� or �do�. Careful if you make changes, since the points �disappear� once you click on them and remain unseen when you go back. Hope your students have fun! 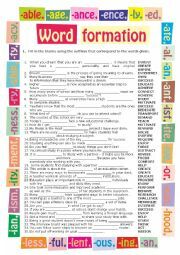 An editable exercise for intermediate students to practice word formation strategies and vocabulary related to the movie Warm Bodies. A PPT for pre intermediate students to practise keyword sentence transformation with the comparative structure �as�.as�. Students have to transform the sentence comparisons using the prompt word. A Powerpoint editable exercise for pre intermediate students based on the movie The Shallows. Students have to report some quotes displayed and the answers are revealed later. Hope it comes in handy!